The crew of the UAS Helix encountered their old friend Arlon Jett! He’s got a new lead on Dr. Armstrong but can’t act on it because Mr. Silver is keeping too close of an eye on him. He asked his old compatriots to travel to Genevan space and prevent Armstrong from being captured or killed by Mr. Silver’s men. Having stocked up on supplies, the crew now prepares to attend Armstrong’s talk at Belaviure University on the Genevan world of Parisia. With the crew’s business on München complete, the Helix makes the short flight to the neighboring moon of Parisia. Minerva brings the ship in atmosphere and docks in Calais, one of the major cities on Parisia, and the location of Belaviure University. “I’m not going,” Morgan declares. “What, afraid of paying off your student loans?” Minerva quips. “I can’t… I won’t,” Morgan says. “It’s exactly because I know this university so well that I can’t go down there,” Morgan tells him. “H, don’t push her,” Shane warns the cyborg, looking quite annoyed with him. “What?” asks Shane, a bit shocked by the words coming out of Morgan’s mouth. Girly is very out of character for her. “I don’t want anyone to recognize me,” Morgan explains. “I… don’t think that will be necessary,” Shane tells her. They exit the ship and find their way to the nearest shopping mall. As a center for Genevan and galactic fashion, it is nearly impossible to go anywhere on Parisia without running into a clothing store. The crew quickly comes across a fashionable women’s clothing store. “So, we’re gonna need your help with this part, Alex,” Shane says as they enter the store. “Oh, I get it… You’re a genius!” Alex proclaims. “Alright… Let’s see here… maybe this… or... hmm, this looks hideously pink. It will do nicely.” They spend several minutes browsing and eventually come up with a pink outfit that Morgan would never wear; the perfect disguise. “That’ll be one-thousand credits,” the cashier tells them as she rings up the items. “That’s a bit much,” Dmitri replies. “Look, it’s for our friend, it’s super important,” he continues, trying to sound as charming as possible. With a new outfit for Morgan, the crew returns to the Helix. Morgan shudders as she lifts the top out of the bag. “It’s not too girly is it?” Shane asks, seeing Morgan’s disgusted face. “No… It’s fine… I don’t think anyone will recognize me,” Morgan tells him. she puts the top back in the bag and brings it to her room. She returns a few minutes later wearing the new outfit. The others remain silent, for fear of Morgan’s wrath. With Morgan’s “disguise” all sorted out, the crew disembarks once more and they make their way to Belaviure University. It’s quite a ways from the spaceport, but they get there pretty quickly using the mag-train. Morgan then leads them to the campus from the train stop. “So, now what?” Shane asks. “Great, where is that?” Shane asks. “This way,” Morgan tells him. She leads the crew across campus and into a building. The entrance to the auditorium is just off the main lobby. They enter into an open auditorium with a small stage at the front with a podium set up for speakers. “And we can sit up near the front so, in case something does go wrong, we can easily access Armstrong and get him out of here,” Shane adds. They exit the auditorium and Morgan approaches the ticket office. The person behind the counter looks up at her. “Yeah, are there any tickets left for the Armstrong talk?” Morgan asks him. “Great. I’ll take five for my friends over there,” she tells them man, pointing over to the rest of the crew. “Thanks,” Morgan tells the man as she purchases the tickets. With nothing else to do, the crew returns to the Helix to wait out the next couple of days. On Friday morning, the crew returns to the Belaviure campus and claims seats up near the front of the auditorium. They monitor the entrances as students and faculty begin trickling into the auditorium. Alex and Morgan notice a pair of suspicious looking men wearing long coats enter and sit all the way in the back. “Those guys look really suspicious,” Alex says to Morgan. “Yeah,” Shane agrees. “I’ll sit near them and keep an eye out.” He makes his way to the back of the auditorium and sits a few seats away from the suspicious men. A man walks onto the stage. He has balding blond hair and a disheveled look about him. He looks a bit older than the picture, but he is definitely Dr. Armstrong. A professor moves up to the podium and gives a brief introduction. Armstrong approaches the podium, briefly clearing his throat before diving right into his lecture. He opens up with applications of biological engineering and, from there, springboards into alternative biological models of life. The crew, still distracted by the suspicious men, have a hard time following along, especially Alex, who has absolutely no idea what he’s talking about. H, however is completely engrossed in what the man is saying. Armstrong continues on into biologically engineered models of life, creating new types of life artificially in a lab setting. He seems to get lost in his own ramblings as opposed to actually explaining anything. He wraps up with discussing modifying existing life into new structures, but, at this point, he seems to be a lot less coherent. Finished with his lecture, Armstrong steps off to the side momentarily and the professor steps up to the podium again. People start getting up from their chairs and running out of the room screaming. The two suspicious men get up and start moving up toward the stage. Shane, temporarily distracted by H, misses them getting up and attempts to go after them, but he has trouble because of the people starting to run towards the exits. Thinking quickly, Shane teleports in front of them and knocks one of them over. The other shows a temporary look of confusion before reaching for a Pokeball. He throws out a Mightyena which growls angrily, baring its teeth. Alex jumps up onto the stage and attempts to get Armstrong out of the room. “C’mon, we need to get out of here!” she shouts at him. The girl tries to pull him toward the exit, but he doesn’t move. He stares out into the confusion, dumbstruck by the scene unfolding before him. “Hey! Gramps, pay attention!” Alex shouts, jumping and waving her arms in his face. “Hey, Inspector Gizmo, help me get him out of here!” she shouts, turning over to H. The cyborg jumps up onto the stage and together they are able to lead Armstrong to the exit by the stage and get him out of the room. “K.E.Y.S., you’re up!” Shane shouts, releasing his own Pokemon. Dmitri and Morgan follow suit and send out Metang and Bellsprout. “Mightyena, Fire Fang!” the man commands his Pokemon. Flames flicker out of its mouth as it charges forward and clamps its teeth around Shane’s Klefki, leaving the Pokemon looking pretty injured. “K.E.Y.S., Metal Sound!” Shane commands his Pokemon. The Klefki furiously jingles its keys at the Mightyena, but the Pokemon doesn’t seem to be bothered. “Maine, Flash Cannon,” Dmitri instructs his Metang. It builds up a bright light and blasts it at the Mightyena knocking it into the nearby seats. “Édouard, use Sleep Powder!” Morgan commands her new Pokemon. 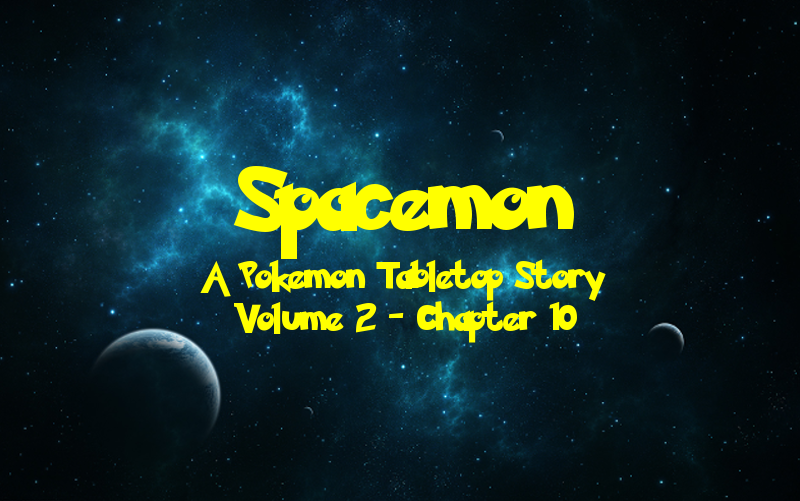 The Bellsprout shoots out a puff of shimmering powder at the Mightyena, putting it to sleep. “D.E.R.P., it’s your turn,” Shane says, recalling his Klefki and sending out his Inkay. The other suspicious man gets himself up off the floor, a pissed off expression on his face. He reaches for a Pokeball and sends out a Sharpedo. “Ice Fang!” he commands it. The Sharpedo rushes forward, its teeth frozen over, and clamps its jaws around Morgan’s Bellsprout, knocking him out. “Maine, Flash Cannon again!” Dmitri commands his Mentang. It blasts another shot of light at the sleeping Mightyena. The force of the blast wakes it up, but it looks pretty worn down. “Go, Jean!” Morgan shouts, sending out her next Pokemon as Shane vanishes. “Sharpedo, Crunch that Metang!” the brutal Pokemon’s trainer commands. It charges forward and sinks its serrated fangs into Maine’s metal armor. Cracks start to form and the teeth sink in deeper. Its eyes start flickering as the cracks spread, then they go out. “Mightyena, Crunch,” the other trainer commands his Pokemon. It lunges forward at Shane’s Inkay, but the squid Pokemon dodges out of the way and the Mightyena’s teeth sink into a chair. “Jean, Volt Tackle!” Morgan orders her Pokemon. The Pikachu starts charging down the aisle, sparking off electricity. He leaps into the air and slams into the Sharpedo, smashing it into the seats. Without Shane to command him, D.E.R.P. 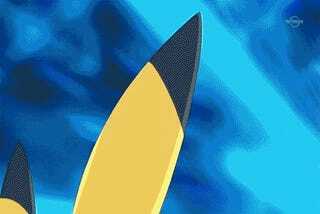 floats over to the Sharpedo and attacks it of his own accord, knocking it out of the fight. Its trainer recalls his Pokemon and moves to run after H and Alex. Dmitri, in a blind rage over the death of his Pokemon, pulls out his laser sword and charges after him. Shane reappears like a phantom and lunges at the Mightyena, whittling it down a little further. Confused at what happened, it lunges at D.E.R.P. and tries to crunch its fangs around the Inkay. The Mightyena’s teeth sink in, leaving the Inkay wounded. “Jean, Electro Ball!” Morgan instructs her Pikachu. Jean charges at the Mightyena and leaps into the air. He throws out a ball of electricity which crashes into the enemy Pokemon, bringing it very close to going down. “Now, finish it off with Volt Tackle!” Jean lands on a seat, then springs off of it at the Mightyena, dealing a pretty heavy blow. Miraculously, the Pokemon stays up, but the blow leaves it unable to move, sparks still coursing along its body. “Mightyena, Fire Fang!” The trainer instructs his Pokemon. Due to being so beat up, it misses the attack and bites another seat, setting it on fire. “Jean, Slam!” Morgan shouts. Her Pikachu leaps at the Mightyena and crashes into it. Somehow the Pokemon still refuses to go down. “R.A.G.E., it’s your turn now,” Shane shouts, swapping out to his Clefable. “Use Dazzling Gleam!” A brilliant light radiates off the newly released Pokemon and strikes the Mightyena, finally taking it down. Dmitri relentlessly chases the assassin who murdered his beloved Metang. He pulls a Pokeball off his belt and throws out his Scyther. “Gigan, run him down!” he commands his Pokemon. The Scyther lunges forward, slashing at the man’s back..
“Agh!” he grunts as the razor-sharp blade swipes across his back, knocking him to the floor. “You killed Maine!” Dmitri yells at him as he points his laser sword at the man’s neck. “No! Oh my God!” the man screams as Dmitri raises his sword to strike. He brings it down, running the blade right through the man’s face. The man slumps, leaving a smear of blood along the wall. Dmitri grabs the man’s Pokeball and returns to the auditorium. He solemnly walks down the aisle toward his fallen Metang. Dmitri continues forward and kneels down in front of his Pokemon, resting his hand upon its lifeless husk. Shane and Morgan start dragging Dmitri with them, but he refuses to let go of his Metang. “You have to leave it or we’ll never get out in time!” Shane shouts. Understanding the necessity, Dmitri reluctantly loosens his grip and follows after Morgan and Shane. Session Notes: Well that certainly took a dark turn… And I’ve come to the conclusion that we’re terrible people. Dmitri’s player was initially was going to kill that dude, but then he wasn’t so sure if he was gonna do it. And then we encouraged him to! Character development! Jokes aside, we did have a Pokemon death… RIP Maine, may your memory live on with the other fallen Pokemon, F.I.R.E. and Cerberus. That Sharpedo was a lethal beast and we only made it worse. Shane’s player has feats that allow him to reroll any roll, and he used both of them on the Sharpedo’s damage rolls, and made it progressively more damaging each time! The goal was to do the opposite! And he had soooo many bad rolls this session. Damn you RNGsus!